Drones with cameras are now a household thing across the globe, it’s a fact! They’ve gone from nerdy toys to modern-day film crews in a matter of few years. But, with such a huge fanbase and plenty of premium models available on the market, there is still one piece missing from the puzzle. The piece that could prove to be the next big thing that will bring drones with cameras even closer to being a 1-man (or should I say device?) film crew. As you could conclude from the title of this article, I am talking about drones with zoom camera… and believe it or not, there aren’t that many drones who possess it. At the moment, for an aerial photography drones to be actually viable, it needs to have several important traits at its disposal. Mainly, I’m referring to a solid camera, some sort of an anti-vibration system and plenty of airtime. For premium models, these traits extend to a motorized gimbal system that allows superior image stabilization and further improves the pilot’s ability to capture breathtaking shots. But, additionally, zoom cameras seem to be a rising trend on the market with 2 recently released premium models boasting with such characteristics. But, what good is a camera with zoom? Camera zoom – what does it represent? This is sort of a silly paragraph, but an important one nonetheless… So, what does a camera with zoom represent? Well, at the moment, due to the fact not many drones come with such trait, zoom cameras can be considered as unexplored territory for aerial photographers. However, it does not mean they are not important. Just one more thing that needs to be discussed before jumping to the 2 drones is, of course, the two types of zoom which are currently available on the market. I believe most of you are well-familiar with them – optical and digital zoom. Believe it or not, they are quite different. Let me elaborate on that. I wouldn’t say that digital zoom is just another software gimmick, but the truth isn’t far from that. You see, digital zoom basically represents in-camera processing of your frame (image). To put it in simpler words, digital zoom simply enlarges a portion of your picture and cuts away the edges. During this process, image resolution is lowered and so is its quality. If you are interested in taking pictures/videos of objects in great distance away from you, then you have to make sure your camera (or drone equipped with one) supports optical zoom. It relies on proper zoom lens which bring distant objects closer to the frame without sacrificing resolution or quality. In other words, if you think you’ll be using zoom option frequently, optical zoom is your go to option! Now that I have told you everything there is to know about zoom cameras, it’s time to take a closer look at the best drones that come equipped with them! We’re starting off with a drone that doesn’t seem like much. Actually, it’s quite an unknown figure on the market and not getting plenty of sales like more mainstream ones. However, AEE AP10 has something most other drones don’t have. Of course, I’m talking about the zoom feature on its camera. Unfortunately, this is not a sophisticated aerial platform meaning you won’t be enjoying optical zoom. Instead, AEE AP10 decided to go with digital zoom that works pretty good, but is nowhere near the quality of following 2 models below. As far as the camera is concerned, we are talking about a built-in one. It’s not too good, but still has full HD recording capability which is a good sign in this price range. Forget about hardware stabilization though, that would pump the price by at least double the amount. Moving onto the specifications, AEE AP10 looks decent as far as the official numbers are concerned. The specs sheet claims roughly 25 minutes of flight time and cca 500 meters of range. In real-life flying conditions though, you’ll be enjoying yourself around the 20-minute mark, even if you’re recording videos. Range, on the other hand, remains solid with 400+ meters, depending on the surrounding area and possible interference. Lastly, I’d like to point out the addition of GPS in AP10 which greatly increases its overall value, making it a highly affordable GPS-powered drone with digital zoom capability. For beginner aerial photographers, it doesn’t come much better than this! Even though Walkera isn’t exactly the most popular brand for aerial photography drones, their Voyager 3 model has had a fair share of success on the market. That’s due to its awesome characteristics and great AP utility finely poised with flashy design. People love it and there’s nothing else to say about it. Driven by that success, the folk over at Walkera decided it’s time to post a proper upgrade in the form of a successor. Thus, today, we will be taking a closer look at Walkera’s next gen aerial photography drone called Voyager 4. What can it do and is its zoom camera any good? All that and more will be portrayed down below! First of all, I feel like I should tell you a bit more about the camera that Voyager 4 comes with. We are talking about a Walkera’s model that can record in 4K resolution and sports a sophisticated 3-axis gimbal for in-flight camera controls and anti-vibration effect. Of course, this camera comes equipped with a zoom lens. More precisely, we are talking about 18 times optical zoom that will surely come in handy for those close-up shots of distant objects. 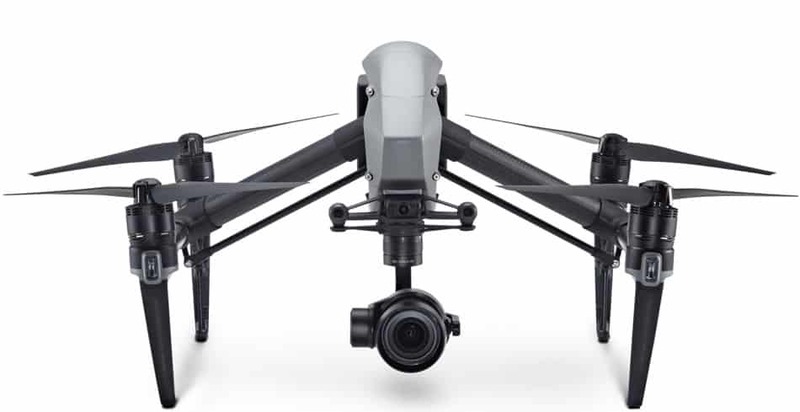 When it comes to the specifications, Walkera Voyager 4 might not be as powerful as DJI Inspire 2 (which is, realistically speaking, on a totally different level than any other drone out there) but still sports fine numbers in this department. We are talking about roughly 1 kilometer of flight range (depending on the area) and approximately 20 minutes of airtime, both of which should be more than enough for professional aerial photographers. All things considered, Walkera seems to have done a great job with this one. Their 4th installment in Voyager series has a certain charm which is bound to attract plenty of buyers… and perhaps you among them, who knows?! The second model that has a zoom camera available is DJI’s professional aerial photography platform bearing the name Inspire 2. It’s a proper beast, I don’t have to tell you that since nothing else can be expected from giants such as DJI. However, even though it has breathtaking specifications and a beautiful design (with a slight twist to the tale, but more on that later on), is it really the best AP platform out there? Short answer – yes, it indeed is! If you’re looking for a bit more elaboration on that one, here is what DJI Inspire 2 is able to bring to the table. Starting off with some interesting features, DJI Inspire 2 packs the whole DJI GO app feature-set, implementing dozen smart flight modes as well as safety mechanisms in form of various sensors. 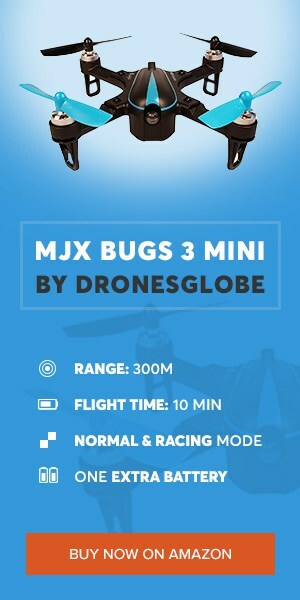 Among those, there is an obstacle avoidance system which will provide you with clean, worry-free flight and let you fully concentrate on the shots you are trying to take. Furthermore, it’s also noteworthy to add that this beauty can be controlled with 2 controllers. 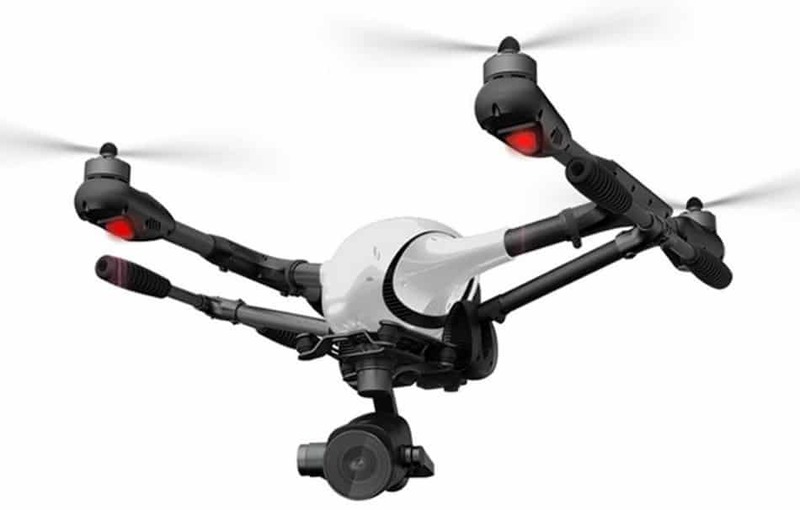 1 is designated for flight while the second one works as a camera controller, giving you full grasp over the camera orientation as well as zoom and other adjustable parameters. When it comes to the actual camera and gimbal this birdie has at its disposal, if you want zoom you should get the package with Zenmuse X5S that supports zoom lenses. More precisely, you will need to get Panasonic Lumix 14-42mm/3.5-5.6 HD lens kit if you want to zoom in with this baby. As far as specifications are concerned, DJI Inspire 2 is nothing short of brilliant. 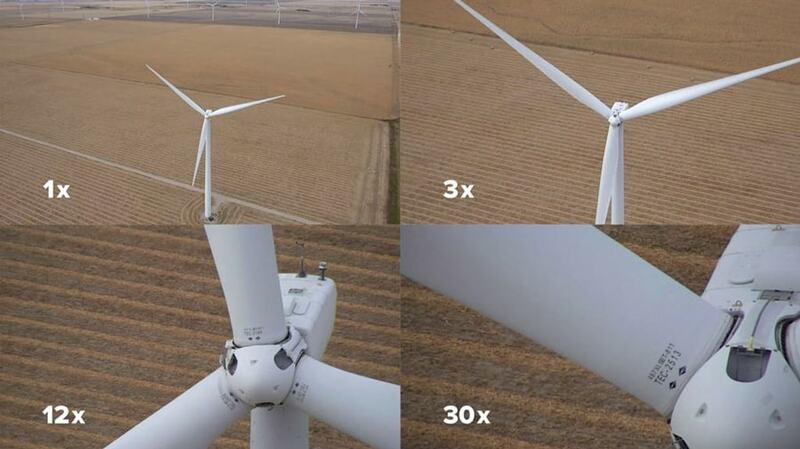 Thanks to OcuSync technology, DJI Inspire 2 can easily reach 5 kilometers, all the way up to 7 in completely open areas. When it comes to airtime, you’re looking at roughly 25 minutes, perhaps a bit less than that if you’re going heavy on the DVR function. All in all, it comes without question that DJI Inspire 2 is a top flight aerial photography platform. Plus, thanks to its zoom capability, it’s safe to say it’s currently sitting on the top of the market. What can you do with drone with zoom camera? The possibilities are endless. However, without proper training (and by training, I mean some sort of a filming/cinematography online courses at the very least), your range will be well and truly limited. This does not mean you won’t be able to use a zoom camera. Not by a long shot… But the truth is you’ll have a much narrower list of quality methods at your disposal. Obviously, zoom cameras do a great job when it comes to recording quality opening scenes. Whether you’re looking to introduce a certain area (village, house, or virtually anything you can think of), you can rest assured a slow and steady zoom from a good distance will do the trick just fine. You’re trying to emphasize an important topic? Or, perhaps you’re looking to take that perfect snapshot of your main character’s facial expression in a harrowing crisis? Fast and sudden zoom in could do you a world of wonder. Plus, it’s very popular in drama’s nowadays. Finally, I would just like to say a couple of concluding words and end the this “best drone with zoom camera” article with a proper conclusion. So, zoom cameras… Drones are finally approaching this uncharted territory, and if those 2 are good assumption on what follows, I believe 2018 is going to be an excellent year for all aerial photographers out there. With lots of new models coming, some of which will support zoom cameras straight out of the box… there’s no doubt AP is getting on a whole another level!